HIPAA is the acronym for Health Insurance Portability and Accountability. It is a primary law in the United States which keeps the medical records of the patients private using certain standards and it also provides other information like health plans, hospitals, doctors, health centers, and so on. It aids in keeping the medical information secure and also maintains the privacy of particular data. 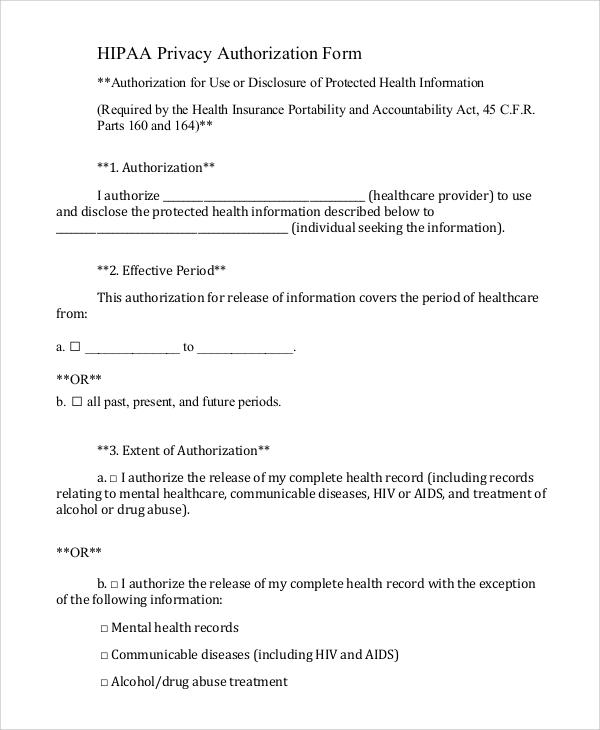 This Medical HIPAA Release Form Samples provides an authority to view the medical information that is protected. 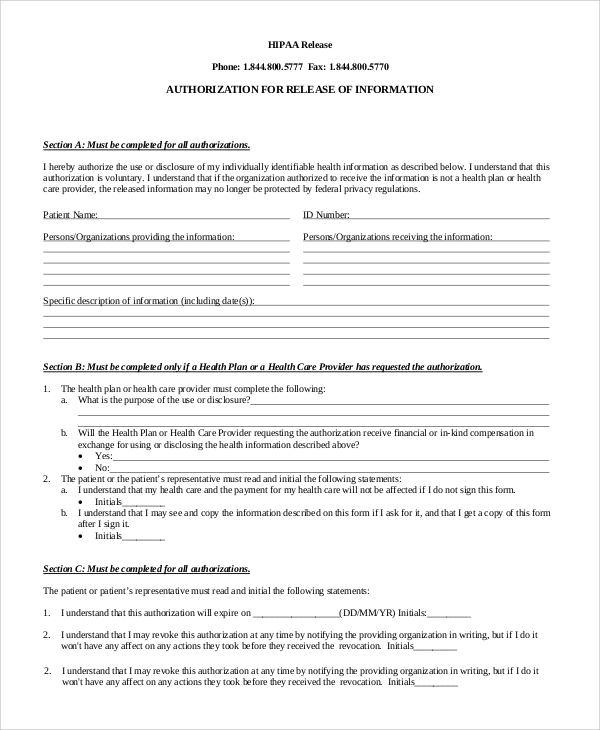 HIPAA Authorization Release Form is required to be filled to give out the necessary information. 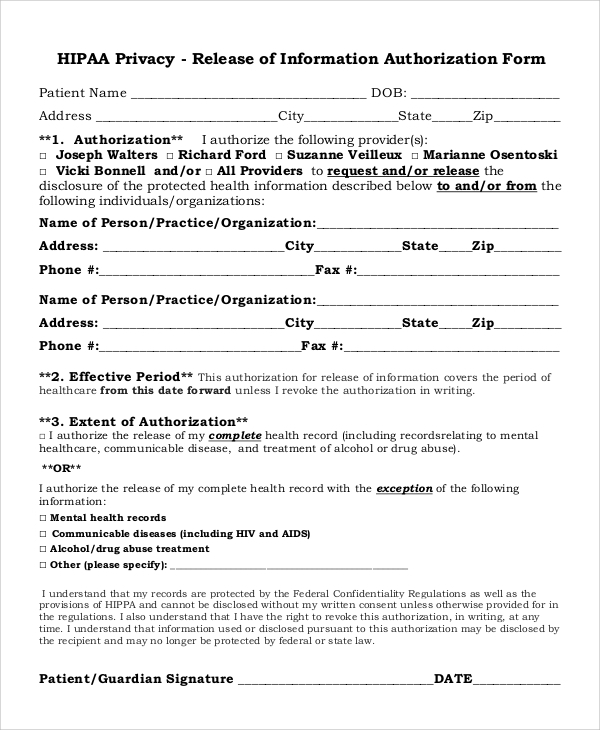 This HIPAA release form, upon completion, authorizes that the health condition of a particular person can be made available to the person seeking it and this information can be disclosed to other individuals with or without the consent of the patient. 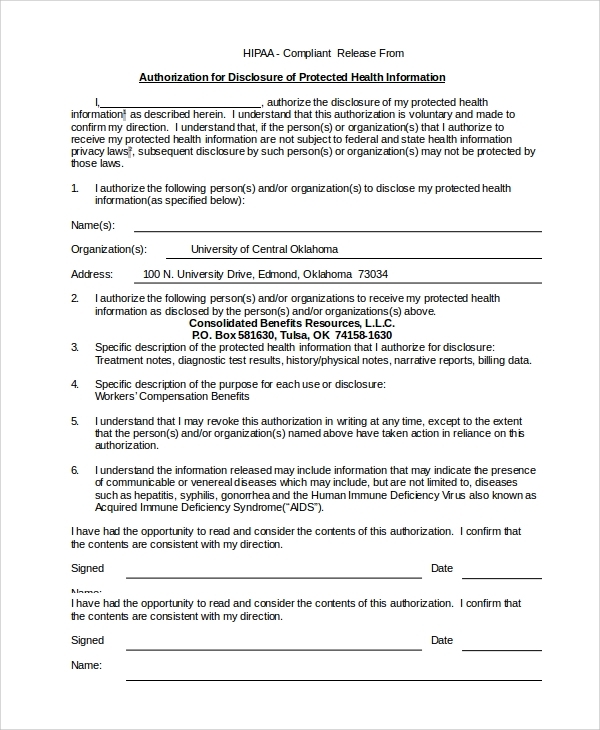 HIPAA Privacy Authorization Form ensures that if all the details like the patient’s name, date of birth, address, city, state and mobile number are filled, then according to the law, a copy of the details of medical record can be given to the ones requesting it for a given period. 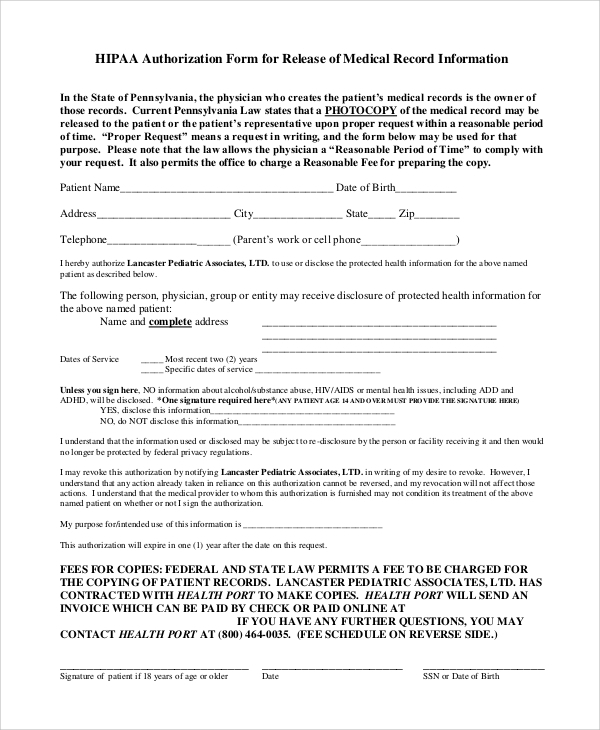 HIPAA Medical Records Release Form is used in the state of Pennsylvania where a proper request has to be made in writing to the officials to seek the private health details of a patient. 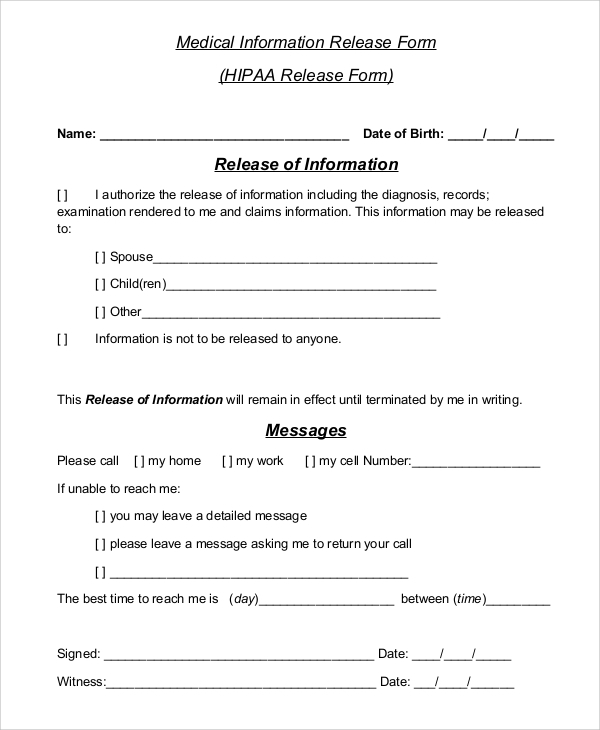 This kind of HIPAA release form allows the details of the patient’s release to a spouse, children or parents. The information can be locked after it is terminated by the patient. Mobile number and the best time to call must be specified in the template. 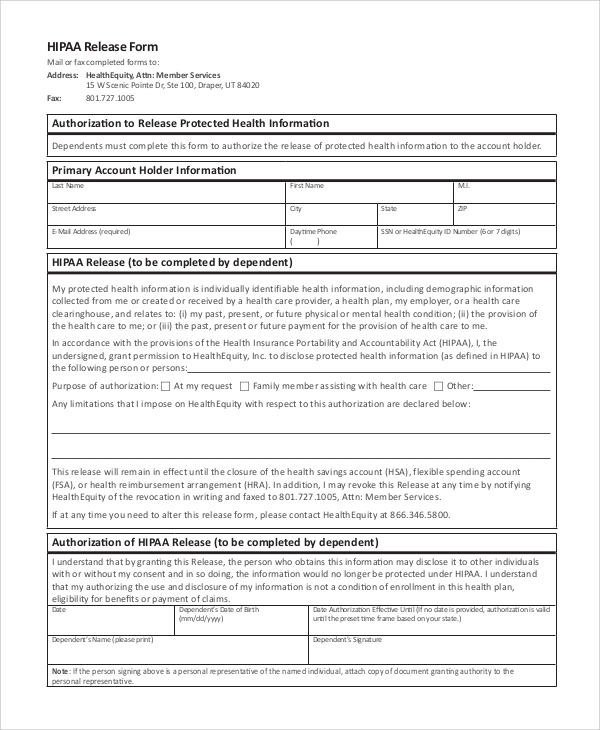 HIPAA Compliant Medical Release Form has the format that can give authority to any single individual or an organization to access the individual’s details. The complete details of the receiver must be included in the written document. The doctor or physician authorizes the individual who is seeking the information to view the health-related information. The Hipaa Release Forms explicitly mentions the duration for which the data must be disclosed i.e. the start date as well as the end date. The complete health record can be released to the seekers or a few exceptions like the mental health records, alcohol treatment, communicable diseases, and so on, can be withheld. This particular information can only be used for consultation purpose or for claiming the bills. The doctor signs the agreement that this information that is released cannot be protected by the law any longer. The patient needs to authorize the disclosure of the information. He/she may give permission to an organization or an individual the access to his/her health information. The name and address of the recipient must be provided. The released information may have the details of communicable diseases of the patients. The disclosed information can be used for taking down notes, billing purposes, to check the results and generate reports. The patient needs to sign the document and fill the details like his/her name, address, telephone number and social security number. A photocopy of this template also has the same authority as the original template. 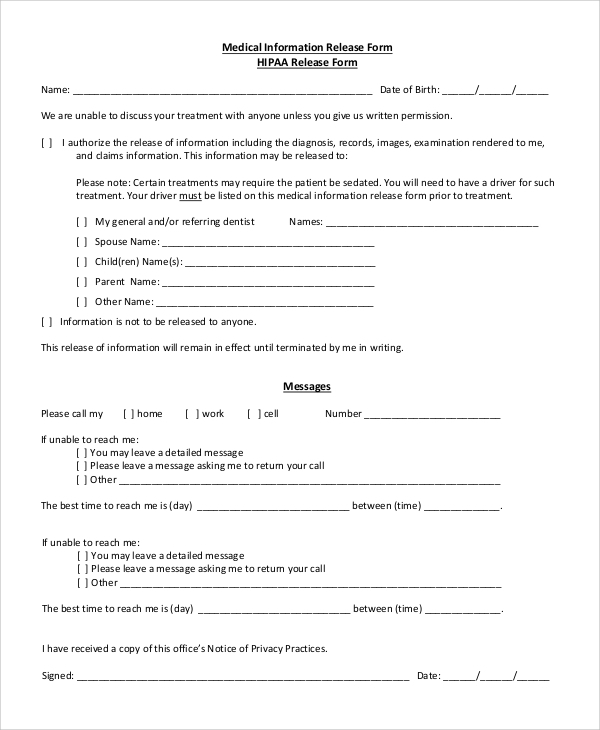 These are the few Sample Photo Release Forms that can be used to gain the information of the patient. The HIPAA Release Form came into effect in 1996 which was signed by the then President Bill Clinton. This act makes sure that any health provider cannot disclose the health information of any patient unless the HIPAA release form is submitted. They are not even allowed to discuss the case of the patient elsewhere.